Whether you are looking for Spider-Man, Wolverine, Deadpool, Black Panther, Captain Marvel, or the Avengers, we’ve compiled a list of the best Marvel baby clothes and onesies. Most of these cherished superheroes have existed in the pages of comics for decades. Only recently have parents had the luxury of dressing their babies in Marvel-inspired rompers and infant apparel. The market is literally flooded with awesome heroic themed baby clothes. We’ve compiled our list of what we thought were the most adorable and unique. MC Hammer said it best when he wrote the song “Here Comes the Hammer.” That might be the perfect theme song for Thor’s mighty hammer, Mjolnir. Although, you could make a good argument that “U Can’t Touch This”, also penned by MC Hammer is a pretty solid contender for one of the most iconic weapons in the Marvel Universe. Black Panther is the pinnacle of the Marvel Cinematic Universe. The film knocked down racial barriers and paved the way for the new standard of superhero films. Hopefully, your child will grow up in this new era of Hollywood movies. 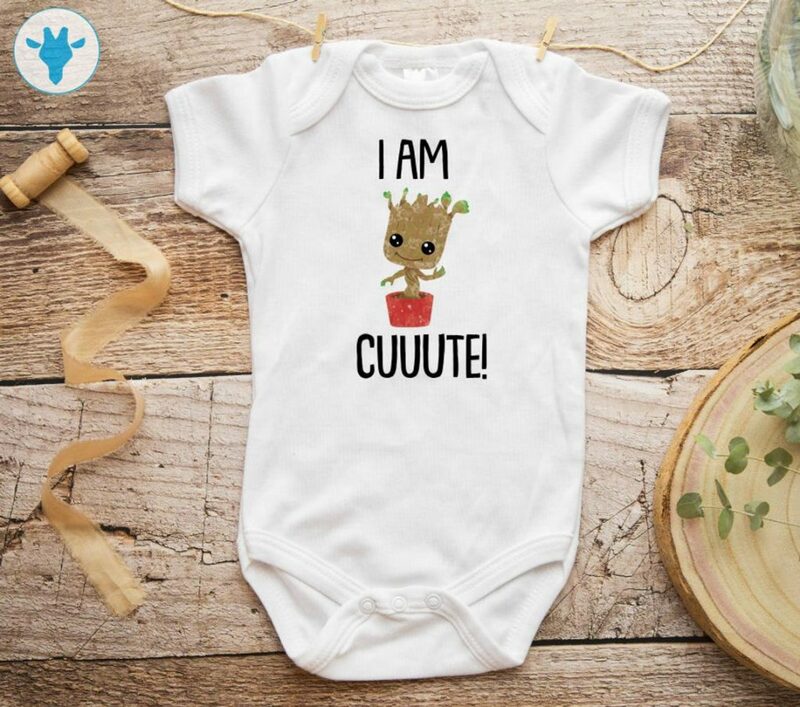 Your little one can learn a lot from Groot. Violence aside, Groot’s loyalty, empathy, and patience makes him one of the most lovable role models in the Marvel Universe. He’s like the child of Treebeard. This is a must have with a great price. Five onesies in one package. My only complaint is that you don’t get any female characters. However, this is still a steal. Reviews claim that the quality remains solid after repeatedly washing and drying. There are only three kings I recognize. The first is Elvis. The second is Ash from The Evil Dead. And third is T’Challa as Black Panther. Sure, there are a lot of other famous kings, but I’m not really the kneeling type. By the way, you get a bib with this one! What type of Avenger do you think your little one will relate to? Hopefully not Hulk. Maybe they’ll be more like Hawkeye, She-Hulk or even Vision. I feel like those West Coast Avengers are a little more down to Earth these days. Nothing wrong with growing up to be Falcon though. Just not Hulk. Captain America doesn’t sleep. Think about it. Have you ever seen him in bed or asleep on the couch? Nope, I think his super serum injection left him completely immune to becoming tired. Sometimes, you might feel the same way about your child. What I like about this romper is it comes with some awesome patriotic leggings. If you just want the onesie then check out the 5-pack above. However, if you’re looking for the complete outfit, minus the shield and hat, you’ll want to order this one. Notice the other variations of Iron Man, Spider-Man, and Hulk. Gotta love those cute baby pants. I’ve talked a lot about the Avengers, but what about Wolverine? Sporting ferocious claws and a not-so-pleasant attitude, Wolvie holds a special heart in all of us. If only your little one had the hair to completely pull this costume off. We’ve got the best Harry Potter baby clothes this side of Diagon Alley. If costume onesies aren’t your thing, then check out this classic X-Men onesie featuring your favorite hack-n-slash character. This Spider-Man onesie is being featured for one reason and that’s because it comes with an adorable hat. It’s perfect for days when it feels like your little rascal is crawling all over the house, including your walls. Finding unique long sleeve onesies can certainly be problematic. We try to feature all the adorable, interesting, and affordable ones we come across, but it’s a real chore. However, this Iron Man romper definitely fits the bell. It comes in lots of different sizes as well. Bundle up! I can’t get enough of these Deadpool onesies. They are just too cute. They make the perfect gift for nerdy families as well. If you want a unique gift, then you’ve found it. It’s 3 AM. She’s angry, hungry, and throwing a fit that will have the neighbors burying their heads in their pillows. Yup, it’s baby hulk. Well, not really. If your child has turned green and sporting large muscles you should probably contact the authorities immediately. Your sweet child can now grow up fighting super villians and delivering justice to every part of the universe. It’s all part of Captain America’s initiative to get the youth involved in physical fitness. That’s a real thing, right? I just can’t stop with these Deadpool rompers. Honestly, we can take superheros too seriously, can’t we? That’s why this onesie is so important. A giant animated tree that fights evil? That’s just plain ridiculous. Wow, this outfit is awesome. You get a onesie, skirt, shoes, and a bow. Perfect gift for someone having a baby or if you are planning a photo-shoot. You can purchase this without the shoes as well….but why would you want to? This romper is one of the cutest you’ll find featured in this article. Groot’s charming personality finds a place in all our hearts just like our little ones. How can you resist not getting this? There are times when you are raising a child that it feels like they control several soulstones. Luckily, this is all in your mind, and while some parents let their kids control their life you can rest assured that your baby will never possess any soulstone nor an infinity gauntlet. Snap! Now you can dress your little one up as the God of Thunder himself. This super detailed onesie comes with a detachable cape and a little hat. Sorry, no hammer included. This is the perfect outfit for a newborn infant. If you are searching for that perfect baby shower gift, then you’ve struck gold. This outfit includes a hat, long sleeve onesie, teething ring, and booties. Got to love those Avenger pants. Arghhhh, don’t make your baby angry. No one likes a baby who is mid temper tantrum. With this Hulk onesie and hat you’ll at least be able to get a laugh when your little one goes into full melt down. Good thing they do not have superhuman strength. He’s cranky, sad, and usually frustrated. No, I’m not talking about your child, I’m referring to that beast called Wolverine. As tough as he likes to think he is, and honestly he’s pretty strong, Logan can be quite the softie. However, you don’t want to get on his bad side. One of the greatest villians to ever appear on the silver screen, Thanos isn’t your average shallow bad guy. He has a heart and truly believes he’s doing good. Yup, he’s absolutely bonkers. Gotta love him! I’m not sure why anyone in their right mind would want their baby growing up to be Deadpool, but I do think this baby outfit is fantastic. We already featured one Wakanda Forever onesie, but I think this one deserves to be on this list as well. Tough decision, right? Why not purchase both? Doctor Strange is the greatest magician in the Marvel universe. He’s also a jerk who didn’t deserve any power to begin with. However, being a superhero has a way of softening up these jerks. How can you pass up a onesie with a cape? Wolverine fans agree that there’s nothing cute and cuddly about ol’ Wolvie. Sometimes, you just want your baby to look serious. This design accomplishes just that. This onesie also comes in pink! You can never have too many Wolverine rompers. You need one for at least five days out of the week. Considering babies go through at least two onesies everyday, this amounts to like two days worth. Oh and by the way, this romper comes in all sorts of colors. She Hulk has a much better temperament than her counterpart, Hulk. However, she’s just as tough. Villains don’t stand a chance. My wish list for schools that I want my child to attend: Hogwarts, Jedi Academy, Starfleet Academy, and of course Xavier’s School For Gifted Mutants. It’s a pipe dream, but how rad would it be to just spend the day in one of these schools. Just don’t tell Cyclops to take off his glasses. Wouldn’t it be cool if we could get Galactus in an Avenger movie? I know he’s appeared on the screen before, but that film didn’t do him justice. He should eat Thanos. Hey, he’s always hungry, just like your baby. Someone would say these three women are the real heros of Wakanda. I think that’s quite the convincing argument. This onesie does come in several colors. For those of you that love cheering for the villain or secretly want your baby to be part of a vile organization, this romper is for you. Hydra does have one of the coolest looking logos is the Marvel universe. There’s a new wall-crawler around these days and it’s not Peter Parker. Gwen Stacey, bitten by a radioactive spider, now dresses up like a spider and fights crime. Evil doers don’t stand a chance. It’s clobberin’ time, the famous line from Ben Grimm as Thing, is a timeless battle cry for comic book fans. Babies kind of look like Thing when they’re still cute and chubby. I think we all know they can do some major clobberin’ as well. We featured the costume romper above, but this design is more traditional for you Strange lovers out there. Trust me, your kid is going to love magic. Might as well get them started early. Any Ant Man fans out there? This romper features a giant ant or is it a normal sized ant? Either way, I think we can agree we don’t want giant ants walking around. Jean Grey has a fascinating story-arc in the Marvel Universe. First, she becomes a powerful leader of the X-men, marries Cyclops, and then evolves into the most powerful mutant in the universe. Not to mention she raised a child. Avengers, who? Have you ever played this popular cat collecting game on your phone? That’s the whole game, you just collect cats by placing items in your yard. The same thing happens with neighborhood kids when you build a pool in your backyard. Moon Knight is kind of an obscure Marvel hero, but he’s quite popular in the comics and video games. Unfortunately, there’s no real Goodnight book featuring Moon Knight. For those of you who love the creator of Spiderman and pillar of Marvel Comics, then this romper is for you. It’s hard to believe Stan Lee is gone, but the good news is that your little one will grow up reading the universe he gave to us. Wouldn’t it be cool to have four kids and call them the fantastic four? They would need to have super powers to be able to afford them all, but seriously you could have your own squad. If only life were so easy. Nova is buddies with Spider-man and has helped save Earth quite a few times. This onesie is definitely a unique purchase for those of you who really love comics. Now your little one can carry around Ant Man wherever they go. Just don’t teach them to roll over or you’ll have flat man instead. These super cute stretchable baby pants are amazing. The bright colors will definitely capture your kiddo’s attention. He’s a real meanie on the playground, or so I’ve heard. The ultimate Spidey villain. My spider sense is already tingling. Talk about a random baby romper. Mysterio is an arch-nemesis of Spider-man, but now he’s got his own cereal. Well, not really. We can dream, right? Honestly, I don’t think your kid is going to somehow sprout superpowers any time soon, but I do know you can teach them to be a powerful force of good in the world. Anyone can grow up to be that kind of an Avenger. I guess that makes these Marvel baby clothes more like uniforms. Your child needs to check off a few things to succeed at becoming the next StarLord: 1. Good musical taste. 2. Witty remarks. 3. A walking tree and raccoon as friends. Baby HUNGRY! SMASH CRY SCREAM! Don’t we just love those precious moments? A bib worthy of keeping food and fluid from staining those expensive onesies you’ve just purchased. Now that’s a super power! Join me when I say, “Hey Marvel baby clothes designers, more of this please!”. Thanks. Why does Thor get to always be a man? I applaud Marvel for letting a woman swing that hammer and bash in the heads of evil doers. It’s not that we mind it when our little one has a meltdown. It’s when they decide to do it at 3 am and you finally went to bed at midnight. Parents everywhere know the feeling of being up all night with a crying infant. We’ve got the scars and horrible dietary habits to show for it.